Embrace Your Competitive Advantage - Coaching and Leadership International Inc.
PCMK�, Power Coaching� with Mind-Kinetics�, is advanced Coaching. At the same time it is easily implemented by the novice or experienced Coach. It unites our greatest inherent abilities with safe, complete coaching tools for the ultimate benefit of our Clients. "As an educator I know the challenges in assisting individuals to improve their performance whether they are students, parents, educators or corporate leaders. Power Coaching� with Mind-Kinetics� and the universal tools have made me a stronger leader, a more loving and compassionate father and husband, and have given me greater clarity on the achievement of my own future goals. Equally rewarding has been the positive results that my coaching clients have received I believe that the most important element of your work is the science of Mind-Kinetics Power Coaching tools work every time to provide clients with the clarity they need." 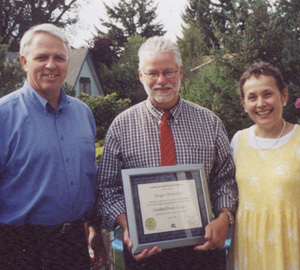 Roger (center) recieves his CPC, Certified Power Coach�, certificate from CLI Co-Presidents Betska K-Burr & John Burr. Coaching and Leadership International Inc. began in 1991 as a coaching, consulting and training company. In 1995, it became obvious to CLI that training and coaching needed a paradigm shift in order to raise the bar and give clients a much higher level of results. CLI, propelled by this need, has researched and developed dozens of award-winning thinking tools which move Clients into a realm of greater prosperity in all areas of life. CLI develops these ground-breaking tools and programs and tests them in the market place. We are now giving other individuals and organizations like you the opportunity to bring astonishing results to families, corporations and individuals around the world. Our Clients tell us that we are The Masters of changing unconstructive habits and behaviours into positive ones faster and more effectively than anyone they know. At the end of the day, we know that we have assisted many in achieving their dream of greater success, joy and peace of mind. And, this makes our lives truly meaningful. We extend a warm welcome to you to join our team of professionals who employ this specialty work for executive and whole-life coaching to make this world a more positive place to live and work. "I highly recommend CLI. Their training, business practices and methodologies are effective, client centred and follow the standards and ethical conduct as set out by ICF. The CLI tools and resources are truly transformational, creating independence and strength in the client, giving them the tools to transform their own lives in a very peaceful way." As you peruse this section you will discover many reasons for choosing CLI & PCMK Certification. You can use these 3 reasons to begin building your list. Skillfully crafted questioning techniques bring about greater self awareness. Using alternating left and right brain connecting questions, the CLI Power Coach� and Client readily see how the Client is using whole-brain thinking to easily develop solutions to challenges and goals. A highly developed intuitive ability. The greatest gift we can give our Clients is our intuition. Power Coaches notice a remarkable change in their own intuitive ability. This is the result of using the processes which open up our intuitive minds. Physiologically changing tools and techniques such as The Brain Walk�. This series of tools, for example, works on the same principles that Einstein used to bring about his many inventions. His principles have been called "Image Streaming" - principles which automatically open blocked 'thinking cells' to allow the brain to "think solutions". With these solutions the Client can then easily take action on their goals. This program is unique because it goes deep into the study of the connection between the body, mind and spirit. For this reason PCMK benefits all types of coaching practices including coaching on business acumen, athletic achievement, life balance/management, goal setting, innovation and couples relationship coaching as well as all types of abuse and child related issues. Here are a few more points about The CLI Difference or you may want to proceed to choose your Course Start Date. We also welcome your calls at 1-866-254-4357, 1-866-CLI-HELPS and will be delighted to provide you with additional information including details about the entire program and multiple possibilities for your coaching certification success as a CLI trained Executive Coach, Business Coach or Life Coach.